When I was 10 years old, I, along with my family, watched Apollo 11 land on the moon on live television. It was the most exciting moment in human history. A child of the space program, I was all things NASA as a kid. I still have my scrapbook of all the Apollo missions. But as the lunar landings wound down and people stopped paying attention, I still got up at 4 AM to watch the live EVAs to see astronauts spin out in their moon buggy. The US space program was my calling. I earned a Bachelor of Engineering Science degree in college and one more year could have set me on a path of aerospace engineering, but my career goals changed when I decided to pursue television and entertainment. I was a newspaper columnist and editor at Ole Miss and I discovered that my creative muses were just as rewarding as time in the engineering lab. So I landed in Nashville in the late 80’s and began building a career in writing and television. 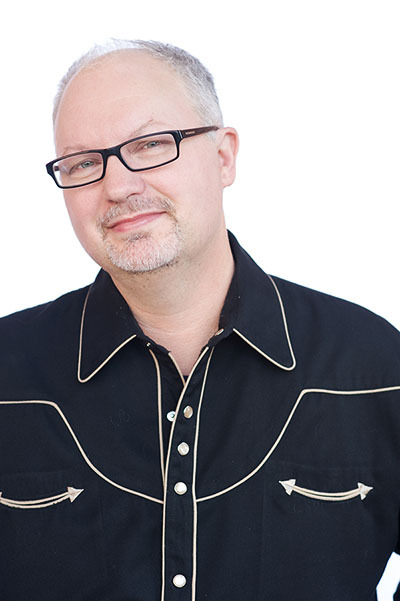 Along the way, I worked with the producers of Austin City Limits and I produced and wrote over 150 episodes of Opry Live for cable television. 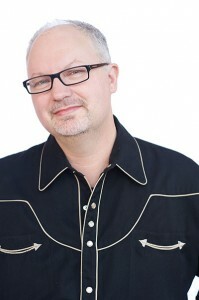 I’ve had the honor and fun of working with a lot of stars, including Brad Paisley, Alison Krauss, and Carrie Underwood. George Jones autographed one of my scripts, so you know that is a prized possession. But along the way, I never lost my love for science. Two of my most appreciated professional compliments came during the productions of Great Smoky Mountains: Code Blue and Earth in the Balance with Al Gore, two shows that married science and public affairs during the 90’s. When The Space Shuttle: Flying for Me went into production for American Public Television in 2013, everything came full circle in my career. 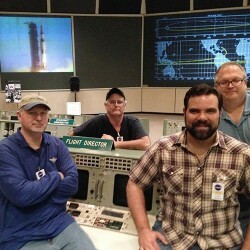 Tim Weeks (left) with Nate Shuppert (right) and tv crew at Apollo Mission Control Room. Here was an opportunity to document 30 years of the space program and interview many of my heroes, astronauts and flight directors. I even got to sit in the flight director’s chair in the Apollo control room at Johnson Space Center! This was a film I was born to do! And it turned out awesome! Released to PBS affiliates this June, Flying for Me shares the human space flight experience in such a personal way, I hope you’ll get a chance to see it. Thank you to our friends at Georgia Tech, where the earliest footage was shot on spec and a special thank you to Nate Shuppert, our director of photography and editor, for helping us make a truly great film. Submitted for Emmy consideration, Flying for Me establishes TWAPictures as an elite story teller and production company. We are ready to fly again.